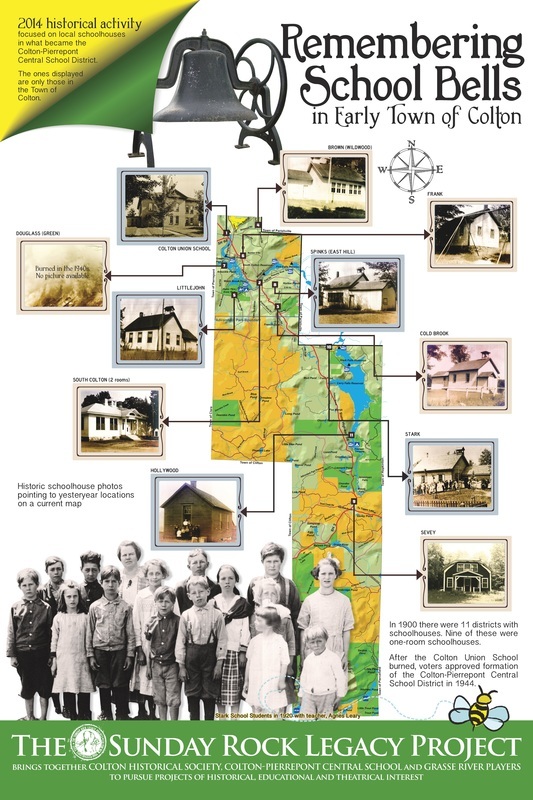 Poster below, displayed in the Colton Museum, shows one-room and other early schoolhouses in town before the creation of the Colton-Pierrepont Central School District. Research on early schoolhouses was done during 2014 as part of The Sunday Rock Legacy Project, a collaborative venture bringing together the Colton Historical Society, Colton-Pierrepont Central School and Grasse River Players to annually pursue historical, educational and theatrical activities of interest. Copies of the 2014 Show Program & Historical Guide are still available including map, photos, excerpts from oral histories and other material from research done as part of the 2014 project.